A new device developed by a physician at the University of Arkansas for Medical Sciences and a researcher at the University of Arkansas at Little Rock could soon be available to treat stroke more effectively. Culp has spent many years studying therapy for stroke. One element of Culp’s work included using ultrasound in combination with the clot-busting drug tissue plasminogen activator (t-PA). The ClotBust ER® has 16 transducers scattered around the inside – designed to line up with the thin points in the skull: the temples and the foramen magnum in the base of the skull. 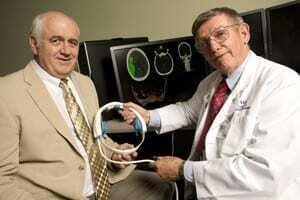 This allows the ultrasound waves to move through the brain without interruption. After the patient is administered an IV containing t-PA, the circular device is placed onto the patient’s head like a sports visor or halo. April 19, 2019 - Q&A: Lifestyle changes to reduce your risk of stroke Philly.comIf a stroke can strike anyone, how important are lifestyle changes to reduce the risk factors? April 18, 2019 - New blood thinner may prevent stroke, without risk for bleeding UPI NewsResearchers say an experimental stroke drug prevented blood clots without the typical side effect of blood thinners: increased bleeding risk.